music and performance, which makes for a must-see event. Today, the city of Tel Aviv sees a new band attempting to shatter the conventions of music and blur the boundaries of performance. TYP – short for The Young Professionals – is taking the act of creating music and throwing it in a blender with everything from art and fashion to dance and architecture. would quickly develop into a musical collective that was a far cry from the traditional band mold. Instead of a guitarist, the duo recruited a graphic designer. In place of a bassist, a web developer was brought onboard. Elsewhere, marketers, strategy consultants and performers were all introduced into the mix. While other bands undoubtedly made use of such services, TYP was adamant that each of these job roles made up a vital part of the band itself, and for good reason too. TYP was to be an aesthetic exploration into a variety of different art disciplines. Inclined to step away from how most other bands performed, Goldstein, Lider and Co. came up with performance concepts that would allow them to exhibit both the band’s musical and non-musical influences. After much head-scratching and plotting, the band would finally make its debut performance in April 2011, and in emphatic style. Stepping onto the stage for the first time, TYP blasted through a set of electronic-infused pop songs at the Fresh Paint Contemporary Arts Fair, Israel’s most influential arts show. The band’s live performance was accompanied by a huge 3D projection which used a nearby abandoned building as a screen. The result was an audio-visual delight, and one that instantly set the band apart from the masses. It didn’t stop there either. TYP would go on to fuse its musical performances with even more artistic formats. The band performed at the Castro Fashion Show as models paraded along a catwalk. A performance at the Blue4Dance Festival in Eilat saw TYP join famed Israeli producer Offer Nissim on stage for a special set that included a mesmerizing light show bright enough to illuminate the darkened desert around it. Perhaps the most extravagant performance of all though took place at the Tel Aviv Museum. The band, performing at the request of the museum’s directors at the opening the new Herta and Paul Amir Building, was flanked by a spectacular state-of-the-art videomapping display which amazed the crowd gathered before it. Each of these performances made it clear that the band was willing to push innovation further. tracks in the bag, enough for a full length album. Happy with the quality of each song, TYP began to prepare its debut effort. Rather than simply compiling an assortment of individual songs, the album would be based around a recurrent theme. The entire band had been built on the concept that young professionals were a group of yuppies that worked in an office during the day and partied at night. The album would subsequently feature songs that each referred to these young professionals at a different time of the day or night. When it came to naming the album, the band went for ‘9:00 to 17:00, 17:00 to Whenever’, which clearly demonstrated the dual roles described on the album. With the album almost ready, TYP decided to rustle-up interest by releasing a single ahead of the album. The release would be ‘D.I.S.C.O.’ a cover of the 1970s Ottawan classic. On 7th July 2011, the band unveiled a video for the single featuring performance-artist Uriel Yekutiel dressed in women’s clothes and dancing alongside four attractive ladies. The band performed at a launch show in Tel Aviv’s Haoman17 club the following night, unaware that the video would thrust TYP into the public conscious. In just 11 months the video would receive more than 1,000,000 hits. Over the next two months the band revealed videos for ‘P.O.P.’ and ’20 Seconds’ the latter of which again featured Uriel Yekutiel, before finally ushering in the new album on September 14th. In support of ‘9:00 to 17:00, 17:00 to Whenever’, the band played an album launch show at The Block in Tel Aviv, as well as a number of other shows. The band would go on to receive nominations for Best European Act and Best Israeli Act at that year’s MTV EMA Awards. a beach party event that followed a 50,000-strong parade through the city’s streets. To the delight of each of the audiences, the four events saw the band joined on stage by Uriel Yekutiel. Somehow, amongst all of the jet-setting, TYP managed to return to the studio to record two new songs to be included on the international release of ‘9:00 to 17:00, 17:00 to Whenever’. Following the recording, the album’s tracklisting was adjusted for the international market, as was its title. On June 18, ‘9AM to 5PM, 5PM to Whenever’ – as the album would now be known – was released in France and Belgium. The release – which received acclaim from fans and critics alike – was accompanied by the band’s first public show in France, an intimate affair that took place at La Gaite Lyrique in Paris, just seconds from the famed Champs-Élysées. The album would receive a further release in North America on July 4th. The summer saw a very busy TYP hit the road and the festival scene. The band performed at the Main Square Festival (Arras, France), the Divers/ Cite Festival (Montreal, Canada) and the Montreaux Jazz Live Festival (Montreaux, Switzerland), before topping it all off with a performance at Prague Pride. Amidst all of this organized chaos, TYP would be nominated for Best Israeli Act at the MTV EMA awards, the second straight year that the band had received such a nod. Meanwhile, back in Tel Aviv, the band became involved in a project with credit card giant, American Express. The ‘Young Professionals’ project, as it would become known, was designed to offer young business talent the opportunity to learn as well as improve their professional careers at an early stage, by way of funding and additional methods of support. 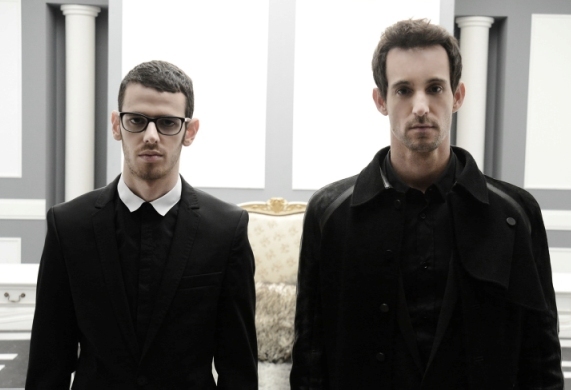 The project utilized TYP’s song, ‘Young Professionals’, as its theme, while a video – which once again included the talents of Uriel Yekutiel and a very TYP-esque feel – was used to advertise the project. Returning to ‘normality’, the band set about readying its next single, ‘Be With You Tonight’. In keeping with the creative nature of TYP as a collective unit, and wishing to connect with listeners, the band set about creating a lyric video using images submitted by fans. This was accompanied by an EP featuring remixes of the track by Mico C, Tristan Garner, long-time collaborator Offer Nissim and TYP itself. TYP would return to the stage for a pair of shows in France. In keeping with the band’s creative focus, a video of the Paris show was created using footage recorded by members of the audience. When added to a high-quality digital recording made at the venue on the evening, the video offered fans the chance to relive the show in its entirety. Following this, TYP created a remixed rendition of the single ‘A l’ombre’, taken from famed French singer Mylène Farmer’s latest album, ‘Monkey Me’. With Farmer’s 12 number one singles in France and more than 30 million record sales, the band was honored to be given the opportunity to add the distinctive taste of TYP to the song. As the year comes to a close, TYP plans to continue returning to a live setting that allows for the musical innovation captured on recording to dance with art in its many forms, together generating the type of audience experience that allows the band to stand-up and stand-out.